(written by Jen; approved by Ian) I am not immune to saying and thinking dumb and naive things. For example, before our recent trip to Kenya, a first for us, I thought that going on safari in Kenya would not be much different from our safaris in southern Africa. And, sure there are some similarities, but mostly I was very wrong. Young lion at dusk giving a look. Kenyan safari is the safari of books and movies from which we learned to understand what Karen Blixen meant when she wrote in Out of Africa: “You know you are truly alive when you’re living among lions.” We once went on safari in Botswana for 9 days and saw only 3 lions (it was a great trip regardless, and Botswana is a fantastic place for a safari). 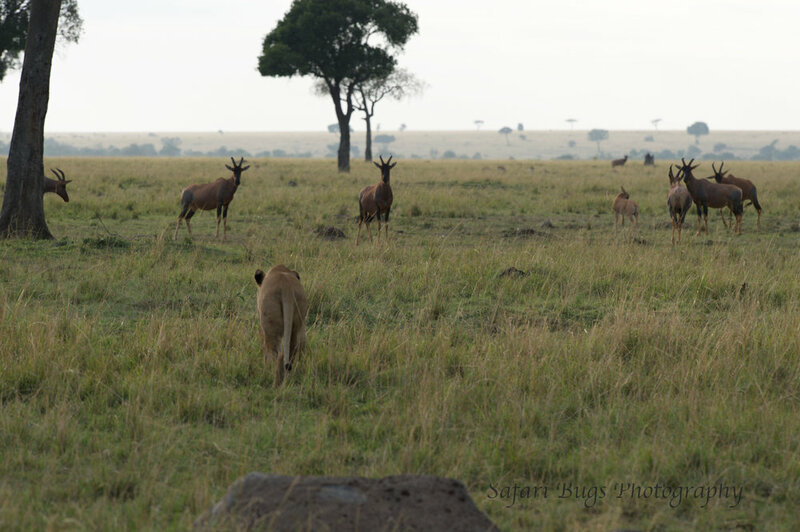 In the Mara North Conservancy ("Mara North"), part of Kenya's Maasai Mara ecosystem, where we stayed at Alex Walker's Serian ("Serian"), we saw at least 30 different lions over the course of five days. If you want to see a hippo in southern Africa, you usually have to seek one out or go to an area that is specifically known for hippos. 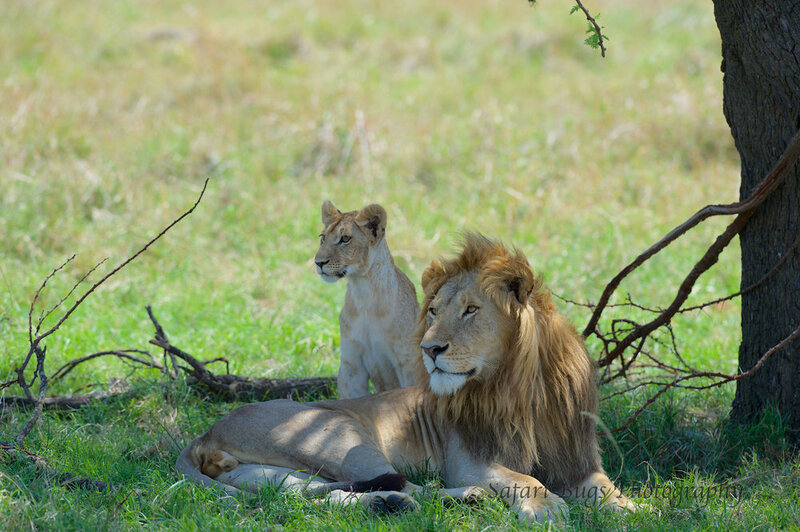 But at Serian, they were outside of our room, which sat on the banks of the Mara river. The following hippo photos were taken from our room at Serian in the afternoons after our morning drives. In the mornings, your wake up call at Serian is in person along with a tray of biscuits and coffee. Hippos get a bit noisy when they return to the river in the morning after a night of eating grass. One morning, Ian (always excited for that early morning wake up . . .) thought the hippos were our wake up call. He responded to the hippos' noisy grunts: "good morning, thank you for the coffee." To which I laughingly responded: "Ian, you're talking to the hippos." Ian, always chipper in the morning, gave me no response. With James on our last morning drive. We spent 5 nights at Serian with a private guide, James. 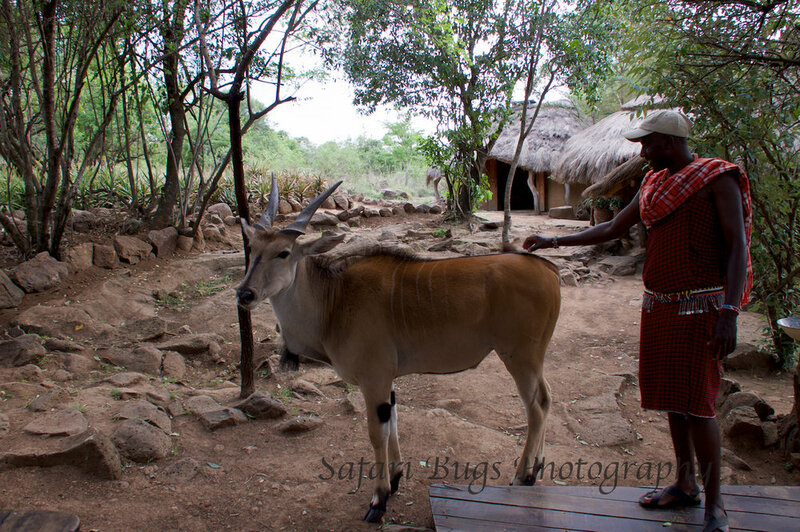 Each morning, we got up early and didn't return until after having a bush breakfast. Our afternoons were spent relaxing in our tent with our hippo neighbors. 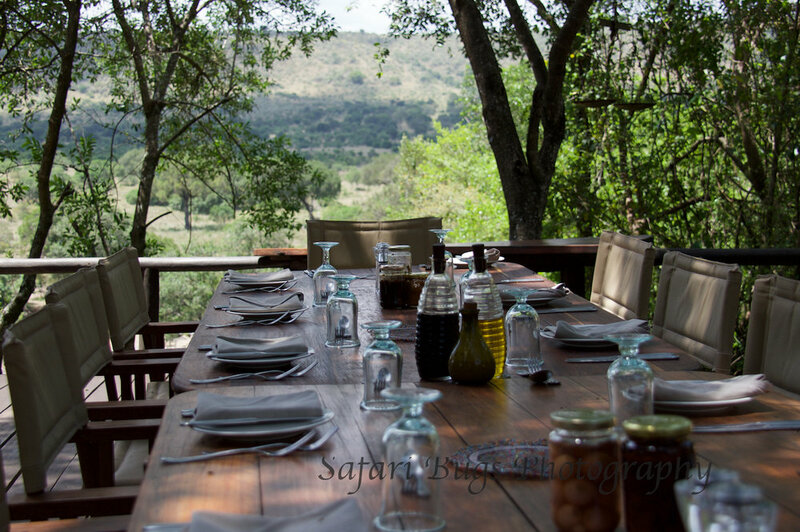 After a camp lunch and tea, evenings were spent on a game drive with the requisite sundowners, ending with drinks by the fire and dinner. The food at Serian was excellent-homemade chips with the perfect amount of salt, fresh ravioli and bacon, vegetarian options made fresh from the camp's garden, refreshing sesame noodles for lunch, and to top it all off, tender Kenyan beef with potatoes, green beens, and halloumi. We visited Serian at the end of October and missed the migration. But this did not impact our animal viewing on safari or in camp. 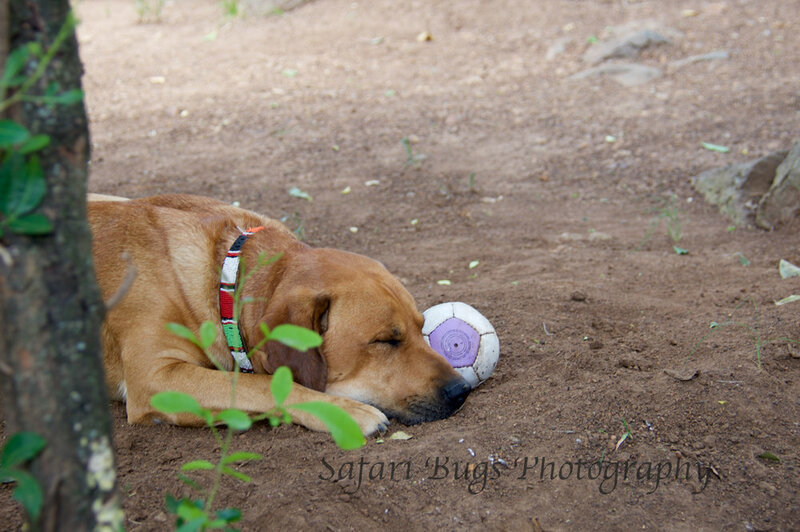 Serian has a sweet resident dog, WiFi (the only wifi in camp), a Rhodesian ridgeback lab mix, and during our stay, an eland, who was attempting to make the camp his home (bad for the vegetable garden, but fun for the guests). The table set for lunch. Our first drive on day one; a beautiful sunset and a G&T solves most things. Days 1 and 2. I traveled to the Mara North from the Lewa Conservancy in Kenya where I spent the prior week, while Ian came in from Nairobi having just arrived in Kenya. We were supposed to meet at the airstrip in Mara North. And, though that happened, it was a bit delayed. After landing, Ian, excited to get things going, got in the vehicle and took off for camp without me. Having been in the bush for a week, I was much calmer than I would have been had this happened at home (like that one time after arriving home late from a business trip, and I had to stay in a hotel because Ian accidentally locked me out). After a few discussions with the airstrip personnel (and a few dollars), the vehicle returned to the airstrip for me. The start to our first day in the Mara North bush was a bit delayed by the airstrip foibles, but after that, the sightings and great experiences were numerous and memorable. Out in the bush, the first 2 days brought playful cheetahs, inquisitive hyena pups, munching giraffes, sleeping elephants, chubby lion cubs, and never ending views. Day 3. At a lost for better words, I simply wrote in my safari diary that we saw "many, many lions." We followed the first lioness we came across to meet up with other members of the pride. She was singularly-minded as she walked by and through the game animals. After meeting up with the male lion and 2 lionesses, there was a half-hearted attempt for a warthog. 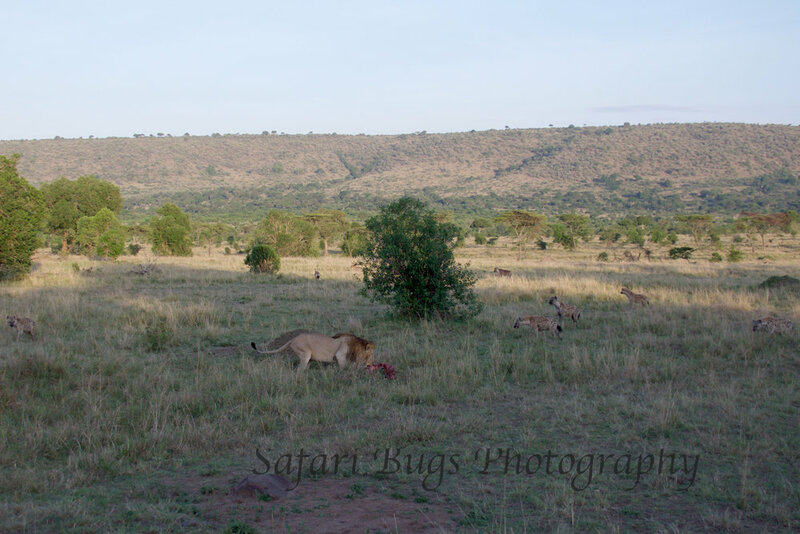 Later that evening as the sun was setting, we saw a different lioness with cubs. We also saw a small buffalo herd, a massive eagle on his baby impala prey, and some more amazing views. Day 4. We woke up early - 4 am early. 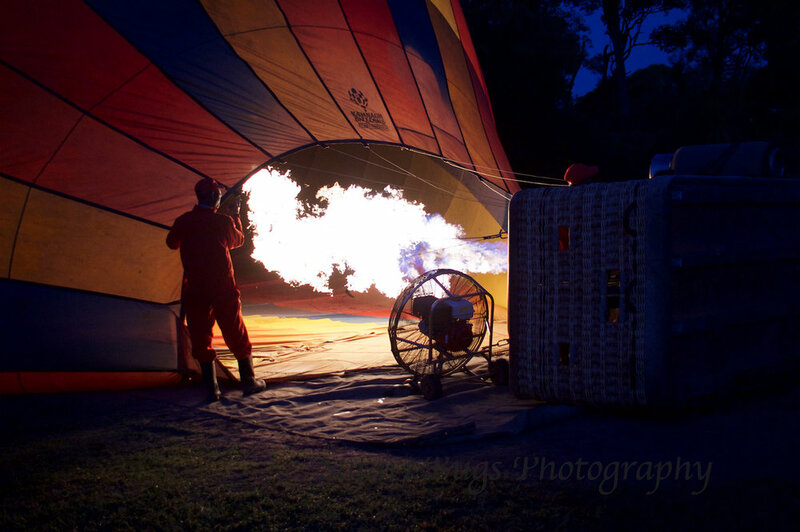 But that is the price you pay when you want to soar over the Mara in a hot air balloon to watch the sunrise. 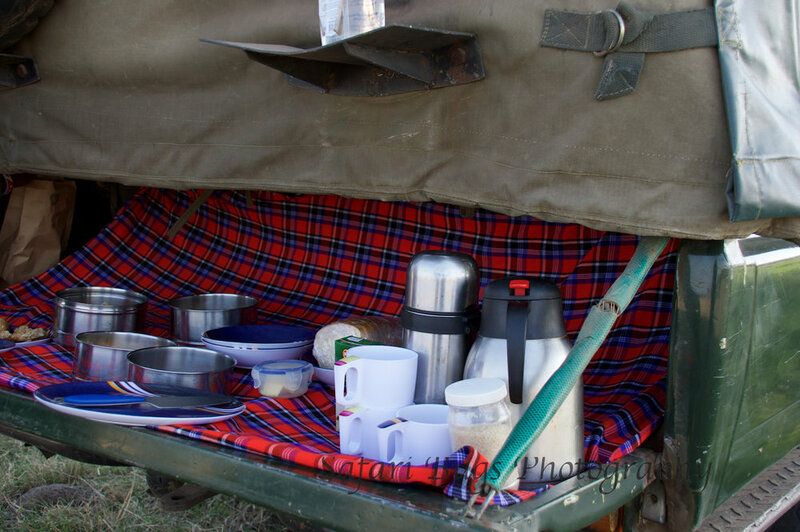 Our guide, James, drove us into the Masai Mara National Reserve to Governors Camp for our Balloon Safari followed by a scrumptious champagne breakfast replete with bacon, sausage, eggs, potatoes, French toast, croissants and pancakes. Our balloon safari host, Sanjay Gupta, was simply perfect in his traditional safari outfit and with his booming (and reassuring) voice. His background makes him a rival for the "Most Interesting Man in the World." (He may have told us he once owned a tech company in Europe and attended university in the U.S.) When we arrived at Governors, the balloon grounds were ripe with excitement as men in red jumpsuits ran around preparing the balloons. We grabbed some coffee while Sanjay explained the rules of engagement. We then scrambled into the baskets and were off, rising over the Mara. Riding in the balloon was like being in a BBC Earth movie, gliding over the Earth with a bird's eye view of the animals below, narrated by the knowledgeable Sanjay. Ian got this short GoPro video of our ride. 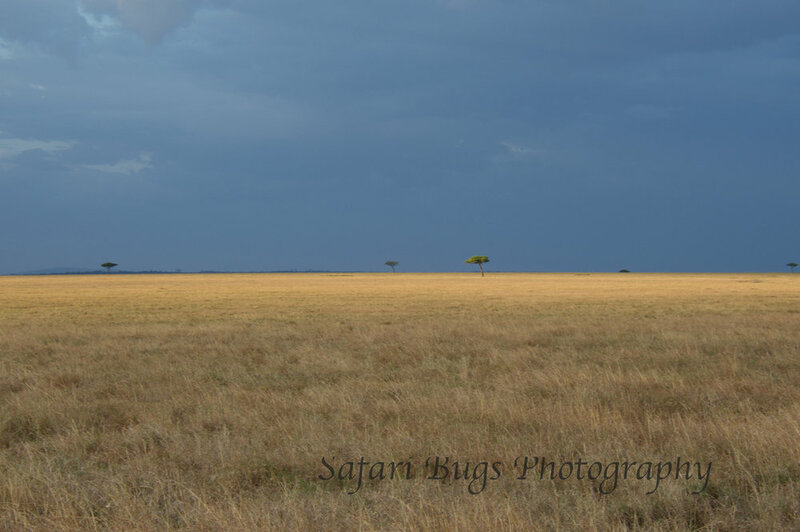 On the way back to the camp, we saw an iconic Mara herd of zebra and wildebeest and, of course, lions. There were 2 active cubs, a powerful mom, and a grouchy dad. That evening, our travel agent and friend, Jeanie and her adorable, energetic, inquisitive four-year old daughter joined us at Serian. (I traveled with Jeanie and her daughter around Kenya the week prior as Jeanie conducted site visits of various camps and locations to gain further knowledge for planning simply the best safaris.) Side note, the staff at Serian were wonderful with Jeanie's daughter who had a great time playing with WiFi, going on the evening drive to see lions, and eating chips on the hood of the car while the adults sipped G&T's, the sun set, and lionesses sauntered past us. Day 5. 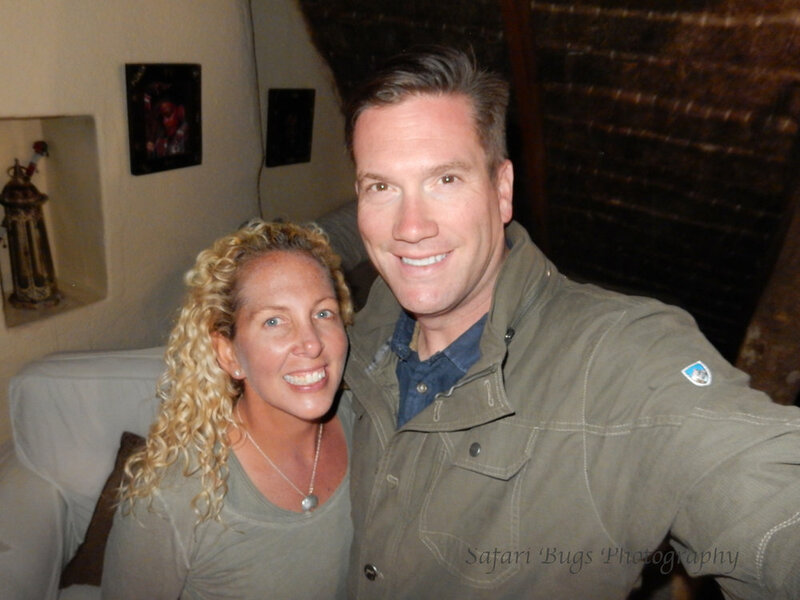 We could have left Kenya on day 4 and would have been ecstatic about all we had seen and done. But we still had one more full day on safari. That morning we had one of the most exciting safari drives we've ever had. Sometimes there is an electricity in the air that foretells something exceptional is on the verge of happening. In this instance, it slapped us in the face just a few minutes out of the camp when we saw a lioness being stalked by a hyena and 2 lions, a full grown and a subadult, who were also being trailed by a hyena. There must be a story behind all of these predators together in one location on the move. 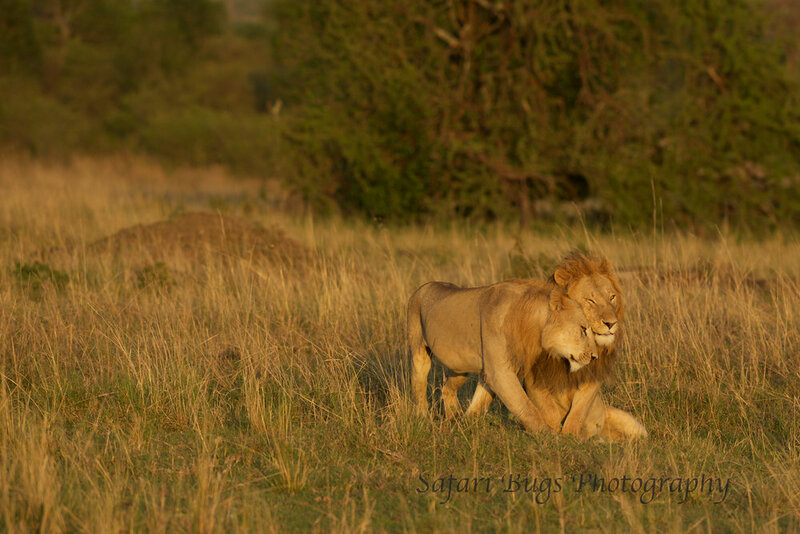 The lioness did a a good job of shaking the 2 males who were from a different pride. 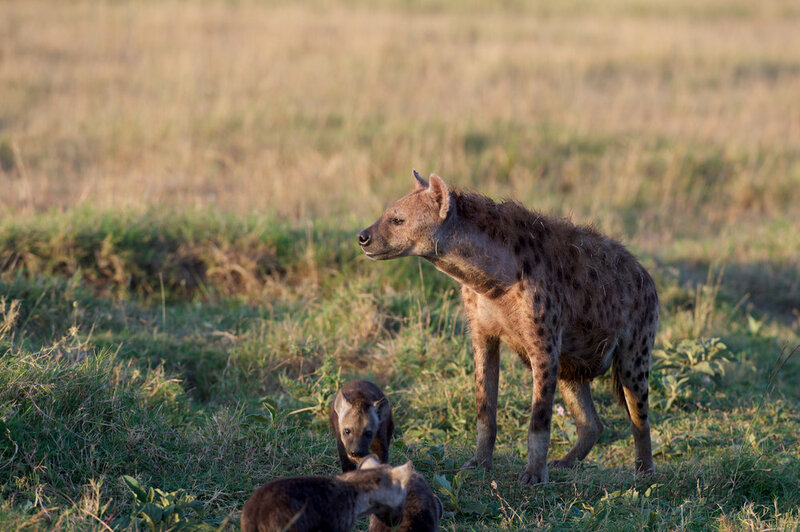 The 2 males ignored their hyena tails as they tried to spot her. 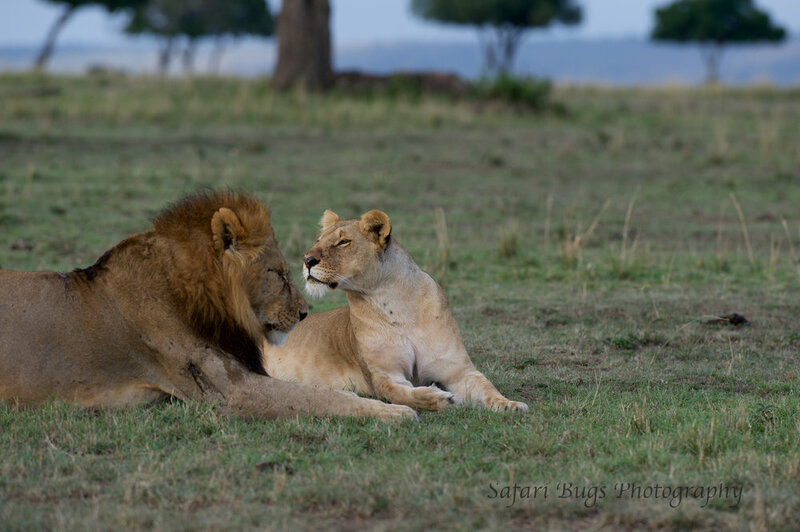 It is unusual to see a lion and subadult lion like this together. 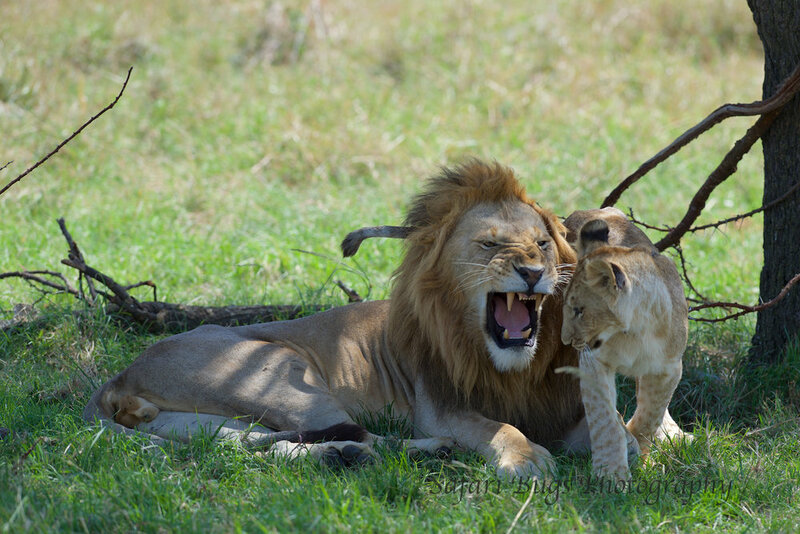 Usually the adult lion will kick out subadults of this age from the pride. And by kick, I mean growl at, bite, and swat. But these 2 were exceedingly close to each other. We were focused on the 2 lions, but what we didn't know was that there were a multitude of hyenas behind us following a third predator, a leopard. Things happened quickly; we heard the interaction, but only Ian saw it with the help of binoculars. Ian saw a leopard kill an impala, which the hyenas promptly stole. Like us, the lions heard the battle, and the three of us (vehicle + 2 lions) made our way to the commotion. The leopard was gone, but the hyenas had started on the male impala. As the adult lion casually sauntered up to the kill, the hyenas ran off, butts down, squealing while the lion began to munch on impala. 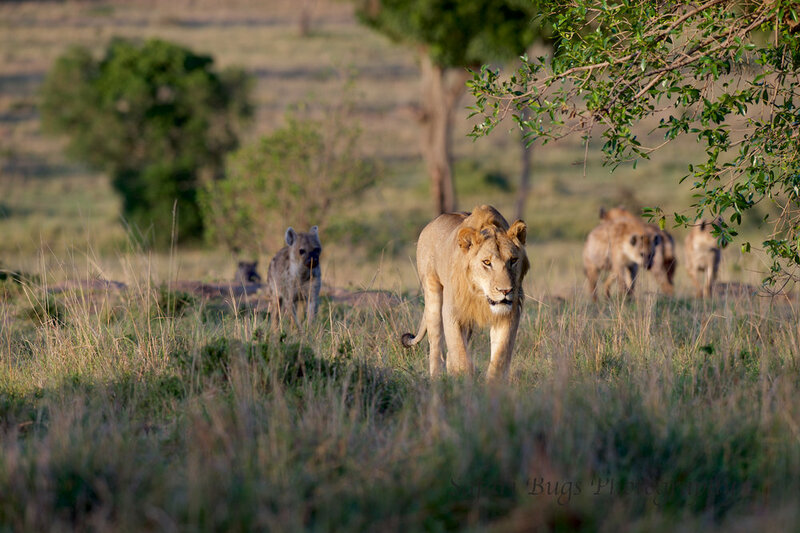 The younger lion made his way to the kill followed by his own set of hyenas and waited his turn for a go at the impala. 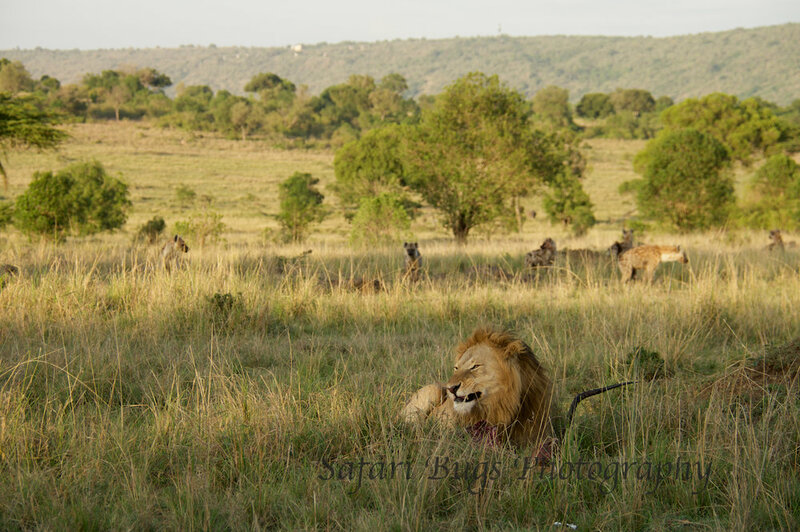 Though chummy while on the walk through the plain, when it comes to eating, the King eats by himself. 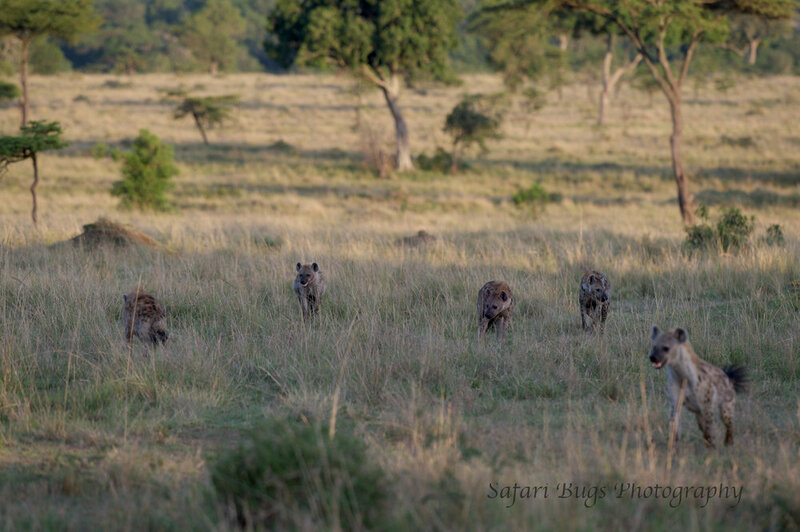 As the lion ate his meal, the hyenas gathered around, chittering and making false starts to scare him off the impala. For the most part, the lion ignored his hecklers, looking up only every so often to give them a snarl. We eventually left the lions and hyenas, and when we rounded back that evening, the impala was picked bare, the hyenas were gone, and the lions had returned to their natural lazy state. 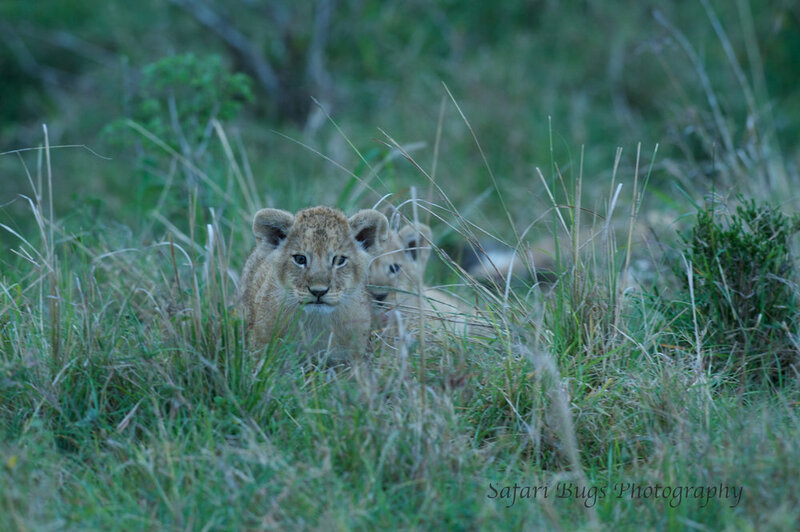 A family staying at Serian getting some shots of the male lion. 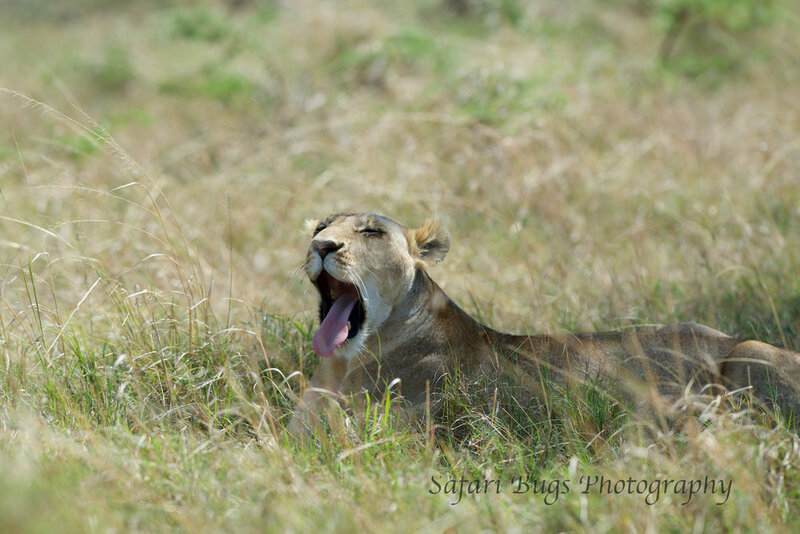 That same day, we also had a number of other fabulous sightings including a still lilac breasted roller, a playful breeding herd of elephants, and sleeping lions. Day 6. On our way to the airstrip, James took us on a lengthy morning drive and bush breakfast. We saw a lioness who walked by the vehicle so closely, she practically skimmed it (and made me hold my breath for a moment), a hyena with small pups, and the ubiquitous topi (an antelope that we saw on every drive, but didn't think to actually get a photo of until the last day). When people ask us about going on a safari, a common question we get is "don't I need at least 2 weeks to go on safari?" We knew that wasn't true as we have gone on a number of safaris that were less than 2 weeks. But what we weren't sure about was how is it when you only have time for 5 nights on safari plus 1 night in the international airport city (in this case Nairobi; often you need to build in at least one night at your destination airport city to accommodate plane schedules). The photos in this blog, all taken during the 5 nights at Serian, show that you can have a multitude of amazing sightings over the course of a five-night stay. But how does it feel to take that long flight for 6 nights on vacation and is it worth it? According to Ian, 6 nights in Kenya was a great vacation. And, sure, he would have loved to have been there for 2 weeks as I was, but some safari is better than no safari, and if that some safari is at Alex Walker's Serian in the Mara North Conservancy, then it promises to be a damn good safari. *Though in a different area of Kenya, this 2013 TED talk by a then 12-year-old Kenyan touches on the difficulties of the communities living with the wildlife. P.S. 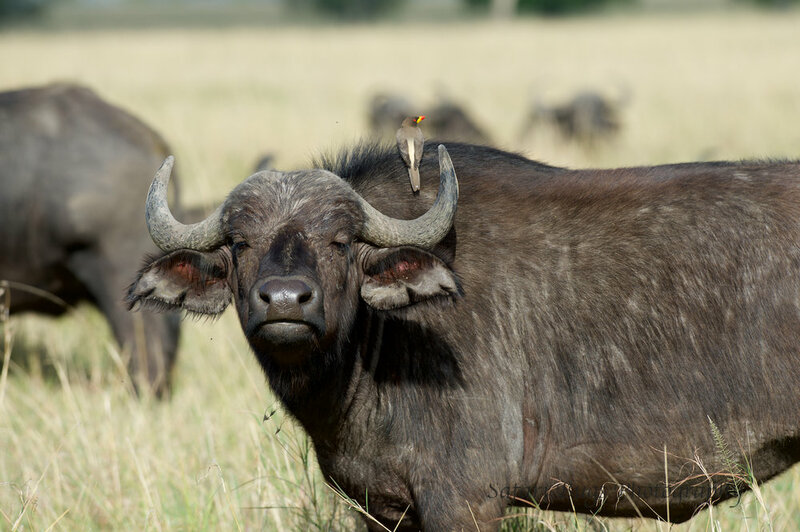 The trip to Mara North was planned by our wonderful travel agent, Jeanie Fundora at Travel Beyond. Jeanie has been planning trips to Africa for 18 years and has been named by Travel + Leisure magazine to its prestigious A-List for her expert knowledge in Africa, having traveled to Africa 22 times. Jeanie is as a fierce advocate for her clients, making sure every need is accommodated on diverse trips from honeymoon safaris to multi-generational family safaris in both East and Southern Africa as well as India. If there’s a way to make out-of-the-ordinary details work, Jeanie will find it. P.S.S. My brother, Steve (who should join us on a safari with his awesome wife Ashleigh), provided editorial support, i.e., finding my numerous typos. And, of course, Ian provided invaluable content for this blog and is my favorite travel companion in life!